Last week I explored the life of Mary of Burgundy, beloved first wife of Holy Roman Emperor Maximilian I. This week I’m turning my attention to his second wife, Bianca Maria Sforza (1472-1510). Often overlooked and overshadowed by the much-lauded Mary, poor Bianca Maria has been largely overlooked by history. Perhaps for this very reason, she was, in many ways, the most intriguing figure to me in my research of Maximilian’s life. 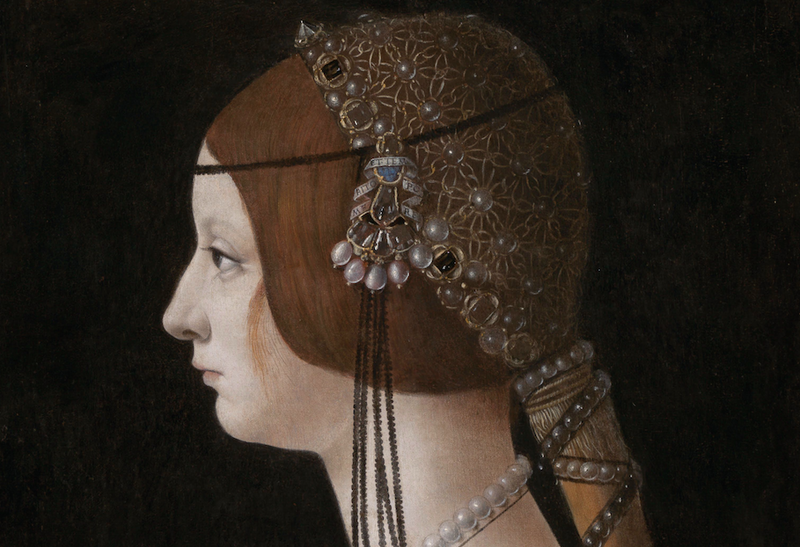 Bianca Maria was born into the powerful Sforza family, who were the ruling dukes of Milan. Like Mary, she carried the heavy weight of a eminent ducal dynasty on her shoulders, and her marriage was thus a matter of great importance. When she was less than two-years-old, Bianca Maria was married to her first cousin, Duke Philibert I of Savoy. It was a short-lived marriage, however, as Philibert died in 1482, before Bianca Maria reached maturity. Bianca Maria’s life often seems to follow a permanently unlucky trajectory. 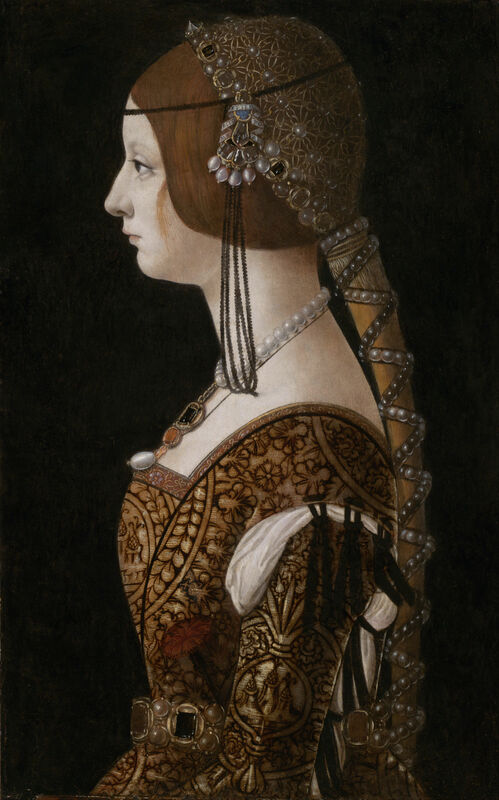 She was the eldest daughter of Duke Galeazzo Maria Sforza, a reportedly cruel and sadistic ruler. When Bianca Maria was four years old, her father was publicly assassinated while attending mass, stabbed to death by three high-ranking Milanese courtiers. She then fell under the guardianship of her uncle, Ludovico Sforza. Most of his attention, however, was focused on Bianca Maria’s brother, the now-Duke Gian Galeazzo, for whom he acted as regent. When Gian died, however, Ludovico himself became the duke of Milan. After the death of her cousin/husband Philibert, the young Bianca Maria endured other thwarted marriages, arranged by her ambitious uncle. 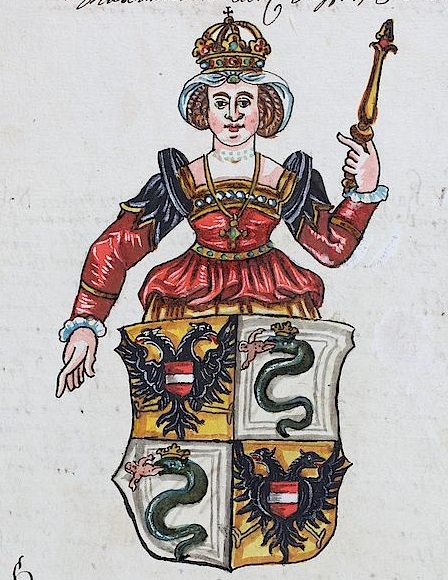 In 1485, she was engaged to Janus Corvinius, the illegitimate but only surviving son of the king of Hungary. When that marriage fell through, King James IV of Scotland was considered as a potential match. In the end, though, Ludovico found his most beneficial alliance in the form of the powerful emperor, Maximilian I. To cement the relationship, the duke offered his niece’s hand in marriage, a deal that came with a substantial dowry. In 1494, the twenty-one year old Bianca Maria married the thirty-four year old Maximilian. The young bride brought with her to the territories of the Holy Roman Empire the richness and opulence of the Milanese court. In August of 1494, a tournament was held to celebrate Bianca Maria Sforza’s entry into the Flemish city of Mechlin. This occasion was recorded in the writings of chronicler Jean Molinet, who described the rich Italian fashions of Bianca Maria and her ladies as being new and novel to the Flemings. Unlike Maximilian’s first marriage, however, this marriage was never a happy one. Maximilian and Bianca Maria never had any children, and, after a short while, they largely kept separate courts and rarely saw each other. Bianca Maria lived forever in the shadow of her predecessor, Mary of Burgundy. Growing up in the care of her power-hungry uncle, she was largely ignored and had never received the level of education and training befitting a noblewoman, such as that received by Mary. Also unlike Mary, Bianca Maria barely features in any of the literary output surrounding Maximilian and commemorating his reign, even though their marriage lasted far longer than his first. Just one example of this is Maximilian’s Triumphzug, a series of engravings depicting a procession of all the accomplishments of Maximilian’s court (as he wished them to be remembered). In it Maximilian pays homage to various events he considered central to his legacy, such as his marriage to his first wife Mary of Burgundy (along with accompanying representatives of his acquired Burgundian territories) as well as that of his son by Mary, Philip the Fair, to Juana of Spain. No section, however, is dedicated to Maximilian’s second marriage to Bianca Maria. Bianca Maria died in 1510, at the age of thirty-eight, in Innsbruck, far from the city where she grew up, in a land where she had never adjusted to the customs, and estranged from a husband who continued to idolise his first wife. At the time of her death, Maximilian was in Freiburg and did not travel back to attend her funeral. Recommended Further Reading: Even less modern scholarship is to be found about Bianca Maria than Mary of Burgundy. She has, however, been the subject of a recent German-language biography: Sabine Weiss’ aptly titled Die Vergessene Kaiserin: Bianca Maria Sforza, Kaiser Maximilians Zweite Gemahlin (Innsbruck: Tyrolia Verlag 2010). (That is – ‘The Forgotten Empress: Bianca Maria Sforza, Emperor Maximilian’s Second Wife.) A chapter on Bianca Maria may also be found in Sigrid-Maria Größing’s biography of Maximilian: Maximilian I.: Kaiser, Künstler, Kämpfer (Vienna: Amalthea Signum Verlag, 2002). The chapter in the biography, whose title translates to ‘Maximilian I: Emperor, Artist, Warrior’, is Bianca Maria Sforza – die arme reiche Braut, or ‘Bianca Maria Sforza – the poor rich bride’. The two titles could not express more clearly the sense of sympathy that Bianca Maria evokes in her biographers.